The 2019 Audi e-tron boasts a maximum range of over 300 miles. Special drive modes give the e-tron an advantage over rough terrain. Interestingly, the more conventional styling is what makes it stand out. 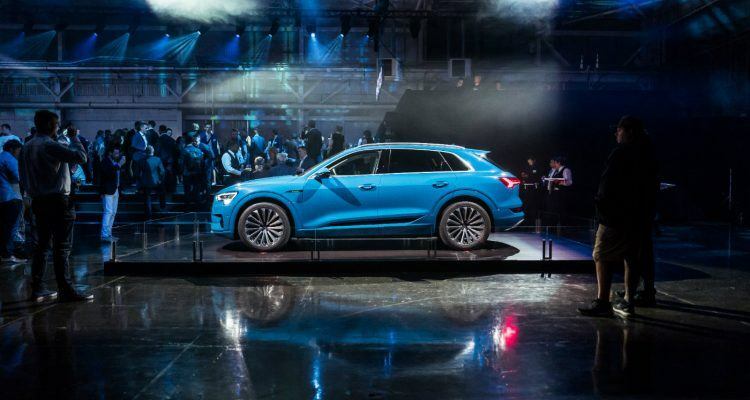 The 2019 Audi e-tron made its debut in San Francisco in September. It’s a conventional-looking SUV with none of the styling quirks associated with electric cars. The Audi e-tron is sure to give the Tesla Model X and Jaguar E-PACE/I-PACE a serious run for the money, and I say that with no hint of sarcasm. It’s quite refreshing for an electric vehicle to look like a normal car. The new Audi e-tron SUV might share the silhouette of the Q5, but there are subtle hints that set it apart. For example, the semi blanked-out octagon front grille and the four horizontal slats on the edge of the headlights, which resemble a smartphone’s battery charging bars. One thing is for sure, though: the styling of the 2019 Audi e-tron is best appreciated in the flesh. Move Over Tesla Model X! I am a big fan of Tesla and Elon Musk. It’s one of those stories where the underdog came out the winner. Musk and Tesla EVs were able to change how consumers perceive the styling, performance, and features of an electric car. I also think the Tesla Model X is one of the best sport-utility vehicles currently in production. But when the 2019 Audi e-tron arrived, it suddenly became clear. 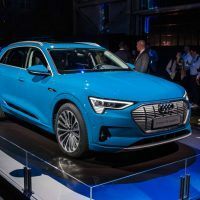 Not because Tesla now has a solid and proper competitor, but Audi was able to beat their Germans contemporaries in the fully-electric SUV segment, ahead of say the Mercedes-Benz EQ C. But what really surprises me with the new Audi e-tron is the restraint. Remember when the Audi R8 was unveiled at the 2006 Paris Motor Show? It was unlike anything I have seen before. The R8, back then, looked like a spacecraft of alien origin. There was no hint of restraint in the styling. On the flipside, the new Audi e-tron looks pretty much like a normal, everyday-driven SUV. And that’s a nice thing to have in an EV, right? I know some people enjoy the attention as they drop their kids at school or soccer practice in a Tesla Model X (what with those unusual yet magnificent falcon doors). However, the Audi e-tron will allow you to simply move on without gathering unsolicited stares. 2019 Audi e-tron. Photo: Audi of America, Inc.
No, you don’t get falcon doors on the 2019 Audi e-tron. But you get state-of-the-art virtual side mirrors. This feature is more than just a gimmick. Chopping off the side mirrors on both sides actually allows the e-tron to slice the wind more effortlessly. The system utilizes small cameras and door mounted displays in place of conventional mirrors. The bad news is this feature is only available in Europe and a few other markets, but it’s still a neat party trick. The beating heart of the 2019 Audi e-tron is comprised of two electric motors. The combined output is 355 horsepower and 414 lb-ft. of torque (265 kilowatts and 561 Newton meters by comparison). The electric motors can increase power and torque output in Boost mode for eight seconds. 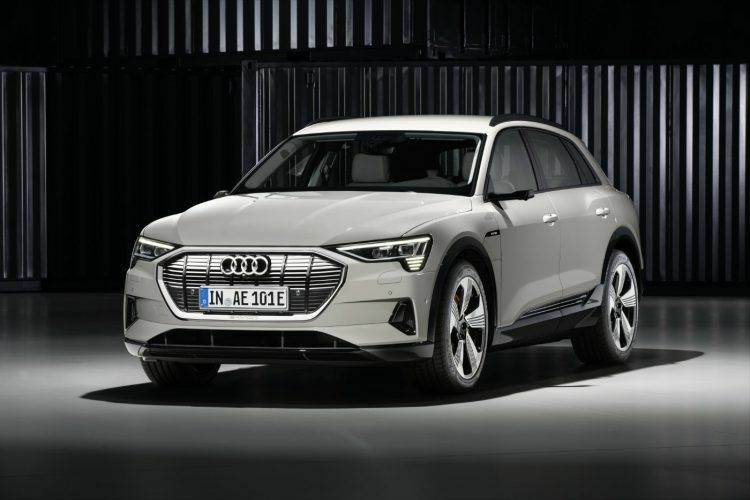 In that span of time, the Audi e-tron is churning out 402 horsepower and 490 lb-ft. of torque. Those numbers are not enough to beat the Tesla Model X, right? Even if the 2019 Audi e-tron can scoot to 60 mph in around 5.5 seconds, the base Model X 75D can achieve the feat in 4.9 seconds. The Tesla is admittedly faster and more performance-oriented. But if you think again, you don’t need supercar-amounts of power to have a good time inside an electric SUV. Powering the pair of asynchronous motors is a lithium-ion battery pack rated at 95 kWh, enough for a maximum range of 310 miles (498 kilometers) when fully charged. The battery pack can be charged using either a 150 kWh DC fast-charging station or 9.6 kW AC 240-volt residential charger. The former refills the batteries with 80 percent juice in 30 minutes while the latter charges the battery pack overnight. Road trip? No sweat. 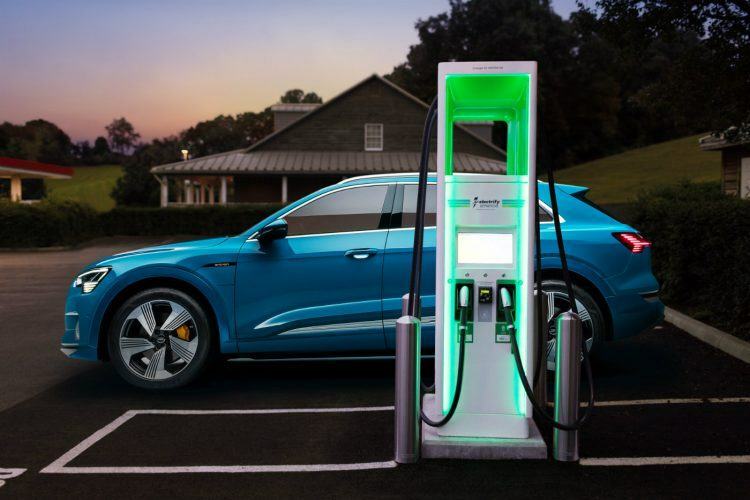 The Audi e-tron supports more than 500 Electrify America fast-charging networks nationwide. 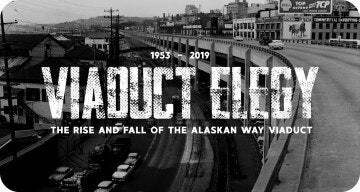 The network currently spans 40 states and 17 metro areas with more coming in the next couple of years. This means the 2019 Audi e-tron can take you further than a Tesla Model X 70D for a lower starting price. 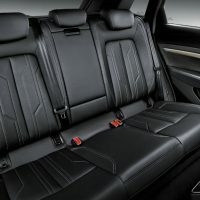 The base Audi e-tron Premium Plus also gets a surprising amount of kit, including 20-inch wheels, a top-view camera system, full LED exterior and interior lighting, 12-way heated and cooled power front seats, plush leather upholstery, a panoramic sunroof, and a Bang & Olufsen 3D audio system with 16 speakers. Not bad for $74,800 right? The new Audi e-tron also earns the distinction of having the first Quattro all-electric drivetrain. The system will digitally link the front and rear axles. Together with a torque vectoring feature, the drivetrain provides grip on all types of road surfaces. In the meantime, Audi Drive Select is responsible for motivating the e-tron over rough and muddy roads. The system can raise the suspension to give the vehicle 35 millimeters or 1.4 inches of additional ground clearance in off-road mode. Select “RAISE” mode and the suspension lifts another 15 millimeters or 0.6 inches. I don’t know many people brave enough to drive the Audi e-tron on a rougher patch of off-road trail, but it’s nice to know it can. The reason why the new Audi e-tron can achieve phenomenal mileage is the brilliant power recovery system. The 2019 Audi e-tron can recharge the battery pack in a variety of ways. Coasting recuperation will activate each time you lift off the throttle. The system also charges the battery via the brake pedal. 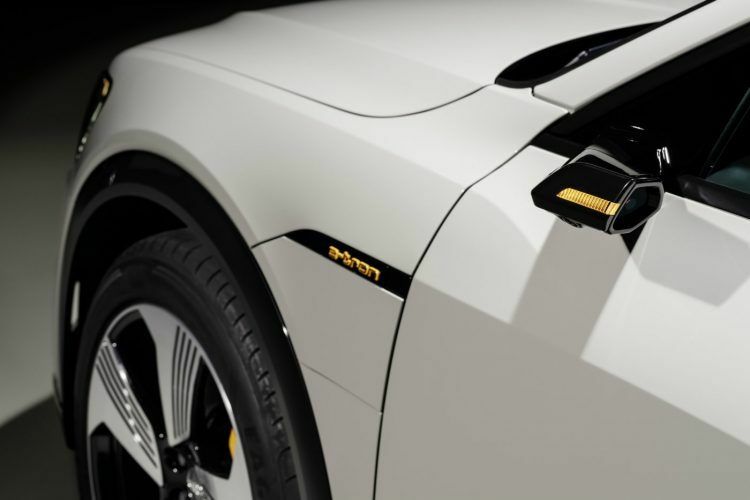 The e-tron can choose either the electric motors or the friction brakes to stop the vehicle. If the system chooses the former, the electric motors will basically function as alternators to charge the battery pack. You can even choose the manual recuperation system using the shift paddles. It all sounds terribly complicated and mind-numbingly high-tech, but isn’t this what Audi is usually about anyway? The 2019 Audi e-tron’s interior is typical Audi. The dashboard and door surrounds are flanked with soft-touch and premium materials. The center console is dominated by a large pair of MMI displays similar to the Q8. In the meantime, traditional dials on the instrument console are replaced by the Audi Virtual cockpit with an ultra-high resolution 1920 x 720 display screen. The interior can accommodate five, benefiting from dual-pane windows, undercarriage sealing, and a plethora of soundproofing materials. The result of all this (combined with the excellent 0.28 Cd of the slippery body) is a hushed ride even at high speeds. The 2019 Audi e-tron, behind all this technology, is still a family SUV. For example, it offers 28.5 cubic feet of storage in the cargo area. Not enough? Fold the rear seats down to get 57 cubic feet of storage. There is also a storage compartment under the cargo floor to stow away a tool kit and a mobile charging cable. Oh, and the tailgate opens electronically when it senses your foot is under the rear bumper as well. If you’re seriously considering the 2019 Audi e-tron, remember it’s best appreciated in the flesh. It will be on display from November 30th until December 9th at the 2018 Los Angeles Auto Show. On November 28th, Audi is releasing a teaser of the e-tron GT concept, an all-electric high-performance sports sedan. 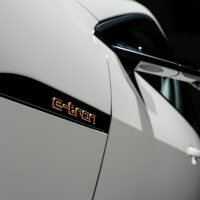 4 Comments on "The 2019 Audi e-tron Will Make You Change Your Mind About EVs"
I have been eagerly awaiting the charge (no pun intended) of the electric vehicle, and Audi’s newest machine is incredible.. However – I have a couple of observations and a question. okay, when is an affordable (30K or less) mainstream electric vehicle coming? Yeah I know about the Bolt.. But when is the next “model T” coming that will turn mr and mrs everyday working class American into an electric vehicle buyer? Also why is the hub motor concept not being considered for automobiles? It seems to me that by placing the motors into the wheels you free up valuable space inside the vehicle? Think about this – four hub motors and a flat battery pack built into the bottom of the chassis means two trunks and lots of interior room. Allowing modern electronics to control the distribution of juice to any/all of the four electric motors means transferring power to whichever tire needs in any situation. Cruising down the interstate on the way to work? One hub motor is pushing (or pulling) you down the road. Hitting the twisties on the way home? All four motors take turns as you negotiate the turns, controlling yaw and making the experience fun AND safe. The possibilities are endless… why are they not being used? Hey Terry, your observations are valid. I remember Mitsubishi toying with hub-based electric motors when developing the successor to the Lancer Evolution series. But that was many years ago, and the e-Evolution concept back in 2017 only had three electric motors, one in the front and two in the back. I heard that electric motors in the hub are prone to incurring damage or reliability issues during initial testing, but I could be wrong here. I agree with you on the (astronomical) price tags of EVs in general. In all boils down to production costs. But hey, the Tesla Model 3 starts at $35k, so it won’t be long until EVs will be more affordable to the masses. Of course, battery technology will need to catch up first. Lithium is not cheap to mine and produce. Good to know that it will come with two electric motors and its large 95-kWh battery pack should enable more than 300 miles of range on a single charge. Really a great car with amazing features.